Heading into the 2008 Figure Olympia, the top two names on everybody's lips are Jenny Lynn and Gina Aliotti. Lynn, the two-time (2006-2007) Figure Olympia champ, is the early favorite to take home title No. 3 and tie Davana Medina (2003-2005) for the most wins in contest history. A host of others, led by the fast-rising Aliotti - the runner-up to Lynn at last year's Olympia and this year's Figure International winner - will try to prevent Lynn from reaching that mark. But Aliotti isn't the only one standing in Lynn's way. Felicia Romero (Houston Pro, Tampa Pro Bodybuilding Weekly Championships), Mary Lado (Jacksonville Pro), Jenn Gates (Atlantic City Pro) Amy Fry (Pittsburgh Pro), Zville Radouine (New York Pro) and Bernadette Galvan (Europa Super Show) all have notched at least one win this season. Add names like Sonia Adcock and Jessica Paxson-Putnam to the list, and this year's Figure Olympia could be the most wide open in memory. 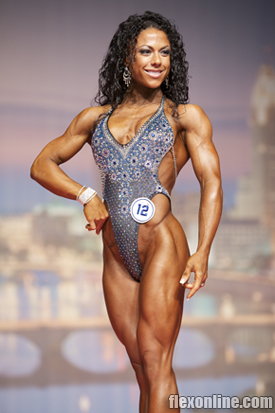 FLEX: Only two competitors have won the Figure Olympia. Why is this such a hard title to win, and what has winning it multiple times meant to you? Jenny Lynn: The Figure Olympia is the pinnacle of our sport and essentially our Super Bowl, so simply qualifying to compete at the Olympia is an unbelievable honor. Having achieved what I have in this sport is still absolutely surreal to me! : Have the new judging standards changed your approach in terms of how you are planning on coming in to this show? Jenny: Not really. I've never been the hardest competitor on stage and I carry considerably less muscle than alot of other top competitors so I prepped to come in as I have in the past. Give me three reasons why you repeat as Figure Olympia champion. Jenny: First, the emails I get from women from around the world telling me that I've inspired them and given them the strength to be their best. There isn't much that could parallel how proud that makes me feel. Secondly, as much as I don't want to let them down; I don't want to let myself down either! And lastly, I'm a really goal oriented person and love having a goal to work towards that challenges myself to be better than I was the year prior. Who are you looking at as your biggest competiton at this year's Olympia? Jenny: No telling! After competing in nearly 30 contests over the past nine years, I have learned that anything can happen and anyone can win. I know I only control myself, so I really just focus on being my best. If I do that, I'm happy, regardless of the outcome. Prediction time: who will be in the first callout? Jenny: No predictions here....we'll all learn together! I feel it's bad karma to go making predictions. First callout ... I'm just hoping I'm in it! GO TO PAGE TWO FOR AN INTERVIEW WITH GINA ALIOTTI! FLEX: You recently won the second biggest title in the sport, the Figure International. Have the new judging standards changed your approach in terms of how you are planning on coming in to this show? Gina Aliotti: Yes. I am very familiar with the criteria changes and have readjusted my training approach to meet the new criteria. I am very excited to step on stage as a much more refined Gina Aliotti. I have taken a more athletic approach to my training and it is very obvious that I am bringing a differently trained physique to the stage. I am bringing the same conditioning but will not be as hard as I have been in the past. I have made my lines appear much longer and more streamlined than they have been in the past. I have always been told to watch out for my muscularity and to bring my same package just a few pounds lighter and that is exactly what I will be doing. I am expecting to step on stage about 3-4 pounds lighter than I did at the Arnold Classic. I am confident that my changes to my training and nutrition will fit the criteria perfectly and be the most balanced physique I have presented thus far. FLEX: Only two competitors have held the figure Olympia crown. How important is it to you to win this title? Gina: Winning the Figure Olympia would be a dream come true! I cannot believe that I have the possibility to be the third figure competitor to hold the title. This will be my third year stepping on the Olympia stage so being the third figure professional to hold the title my third year out would be absolutely mind blowing! Holding the title would just put the icing on the cake aside from all my other accomplishments I have achieved throughout my figure career. FLEX: Jenny Lynn has won the last two figure Olympias. Why has she been so successful on the Olympia stage? Gina: Jenny Lynn knows how to take the stage. She not only has a beautiful physique, from head to toe but has the ability to walk on stage with the presentation of a champion. She holds herself up very well and has the ability to bring her package and beauty in an athletic yet poised and elegant fashion. Jenny has put in her work and therefore has reigned as the well-deserved Ms. Figure Olympia Champion for the past two years. FLEX: Give me three reasons why Gina Aliotti beats Jenny Lynn at this year's Figure Olympia. Gina: have had a very successful year and am coming off a huge win from the Arnold Classic. I feel that I have the momentum to carry me through as the new Figure Olympia Champion. Two: Over the past years I have always brought what I felt was my best package. I have continually received feedback on how I can better that package and done so. Based on the feedback, I have worked hard to make the appropriate changes necessary to perfect my physique. I am excited and confident that I have found the perfect look that not only fits the criteria but also is a perfect representation of what figure is today. Three: Over the years, competing in figure has taken me down a very positive path. Figure has given me the avenue to share with others my true dedication and commitment to heath, fitness and being the best you can be. I am ready to take on the title along with the responsibilities that go along with holding the crown as Ms. Figure Olympia. I am ready to be that next figure icon that is a clear representation of what figure stands for along with and being a clear role model for all aspiring competitors. FLEX: Prediction time: who will be in the first callout? Gina: This really is a tough question to answer because honestly I can name about 15 girls that I would place in the top callout. If I have to answer, this would be my best shot, in no particular order:: Jenn Gates, Jenny Lynn, Gina Aliotti, Mary Elizabeth Lado, Sonia Adcock and Amy Fry.